Although I usually avoid using the Mini when the roads are heavily salt laden, the water and mud is still blasted into the dark corners of the front wings. I've had this shell since the 70's and apart from the nearside windscreen pillar, where the original accident damage was, it has never been restored anywhere. All panels, wings, sills, floor pans and valences are the ones it left the factory with - quite rare these days I'm sure. I regularly clean any deposits from the wheel arches, especially over the head lamp area and the notorious corner under the scuttle but it is covered in underbody wax anyway. There used to be some aftermarket wheel arch liners available to help with this problem but they were, as far as I know, only suitable for the round nosed models. 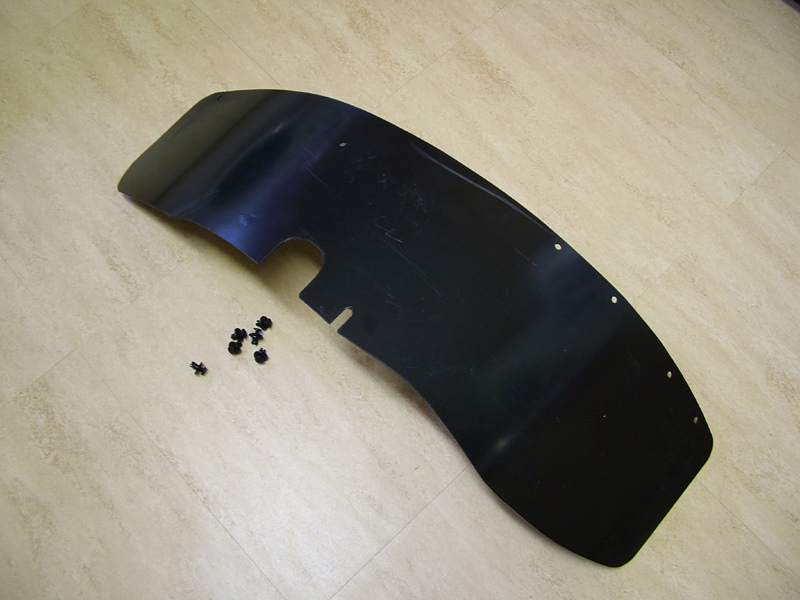 As mine is a Clubman with slightly modified sportpack arches, I can't imagine finding anything 'off the shelf', so I set about sourcing some 3mm black polypropylene sheet. I won't divulge my exact source but the supplier of materials for our Spinal Jackets (when I worked in that field) came to the rescue - many thanks Mike, you are a star man! I was not trying to completely cover the entire arch from edge to edge but if I could deflect most of the crud that would be a big help. I also wanted them to be easily removable for cleaning and needed to avoid drilling holes in any metalwork - plastic brackets and 'scrivets' would be used to prevent any rust problems. The 8mm scrivets were easily obtained via ebay. The first stage was to make a cardboard template from a piece about 4ft long and a foot wide. The first bit needing attention was around the top of the damper and bracket - not too difficult, just a bit of careful measurement needed. 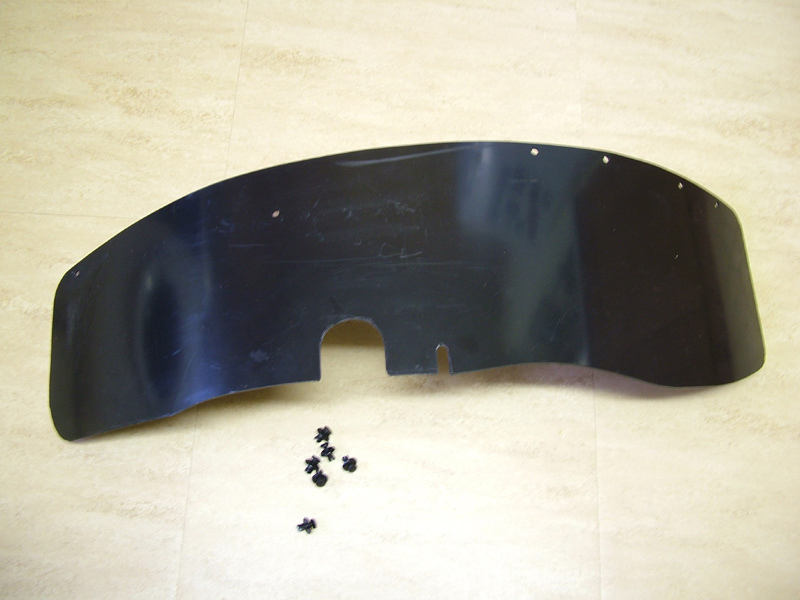 The inner wing contact area was surprisingly easy to follow and then the outer profile was drawn in and cut to size. The sportpack arches have an inner flange at the rear ends for about 10 inches, so that provided a good place to use 4 scrivets. 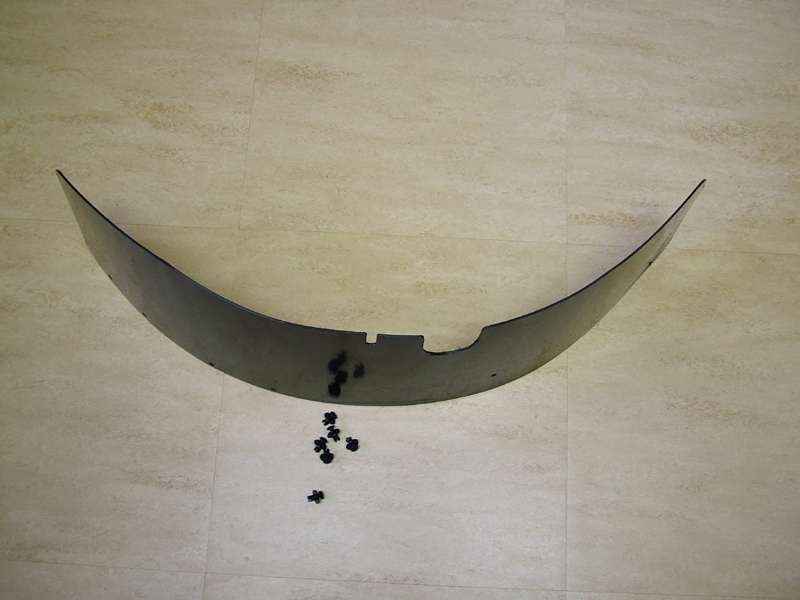 The flange then disappears, so no easy fixing places. I made an L bracket and fixed that to the edge of the inner wing at the 12 o'clock position and a further one behind the lower front corner of the arch extension, just behind where the 'normal' bumper corner fits. These brackets were fixed with 'sticks like sh!t' adhesive and left overnight to dry. With 2 more 8mm scrivets, one in each bracket, this completed the fixings. I've left the rear of the liner slightly long at the rear lower edge to provide a sort of mud flap to protect the sills a little. I might glue some thin rubber strip along the interface where the liner is near the inner wing but I'm not sure it is strictly necessary. Another bonus was that this template when turned inside out, was still a very good fit on the passenger's side. It was then a fairly simple matter to scribe around the template on to the polyprop sheet and then cut it out on the bandsaw. I have a sanding drum which when mounted in the pillar drill can be used to smooth out the edges. I also wrapped a strip of fluffy velcro around the drum, which gives the edge of the sheet a very smooth polished finish - something I learned when trimming edges of Spinal jackets to prevent marking Patients' skin.